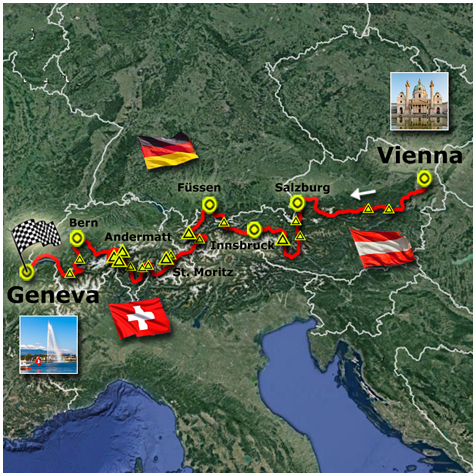 The whole route has been divided into 22 cycling stages with 5 rest days in Salzburg, Innsbruck, Sankt Moritz, Andermatt and Interlaken. The rest days in St. Moritz and Andermatt are planned in a way that you can make an extra loop with some well-known passes. The cycling days have mostly the same schedule : a start early in the morning and cycle the distance at own speed to the next place. The daily distance depends on the profile and the locations of suitable accommodation. It's an average of around 95 kilometres per day. The route follows paved, relatively quiet and scenic mountains roads. We take in the valleys mostly marked out cycling routes, which have sometimes a natural underground and are well passable with a normal road bike. Every day you can expect serious climbing with one or more passes. Some long and gentle, others short and painfully steep. The average elevation gain is roughly 1.500 metres per day. At the start in Vienna you get an extensive tour guide with background information about the route. We advise you to bring a GPS which has the option to upload files. It is a very helpful device to find the correct way without looking at detailed maps or an overload of instructions.